Yes, I like making my own index. Sure, it’s the umpteenth time that you’re read your own text, the one that you (naively) thought was all done when you sent off the final manuscript to your publisher as a file attachment; but then it kept reappearing in your inbox, first with copyediting, which entailed negotiating with the copyeditor over your penchant for em dashes and semi-colons, then for proofing and yet more proofing. You wrote the 150 word blurb, the 300 word blurb, and let them know of all the journals (that they already knew about) where it might be reviewed and all of the conferences that you weren’t attending (where it might be promoted), and so the last thing you want to do is read it all once more to make the index…. So, yes, it’s kind’a pain to make one. I get that. But I like it nonetheless. For while it may be tempting to ask (aka pay) someone else to do it, as the one who wrote the text you’re aware of the little nuggets that you’d like a reader to find, and the index, for those who use it, is a handy road map, where, even if we think that the author is dead, the scriptor can still make some practical suggestions for how the reader might consider using the text. Asking anyone else to do it may save you time, yes, bu it may also result in the sort of unhelpful index that simply lists some key words and names, thereby completely missing the connections, such as the way that a discussion on, say, p. 182 elaborates on some topic even though the supposed key word is never used (thus we’d never see c.f. or “see also” used in such indices). If you think of an index in that way — not just as a way to find the pages on which something is explicitly mentioned but, instead, the places in the book that will assist a reader to figure something out — then the index is hardly an afterthought or just another thankless task that stands in the way of finally getting the book published. Instead, it strikes me as being among the most important parts of a book and something that writers (or at least people experienced in the field) likely ought to take seriously as requiring their attention. For the significance of the book probably doesn’t just proclaim itself all on its own, and a good index can help with that. Oh, and it’s also a great place to insert a few little surprises, for the really committed reader to find (like in the pic above, from an index I made back in 1996). 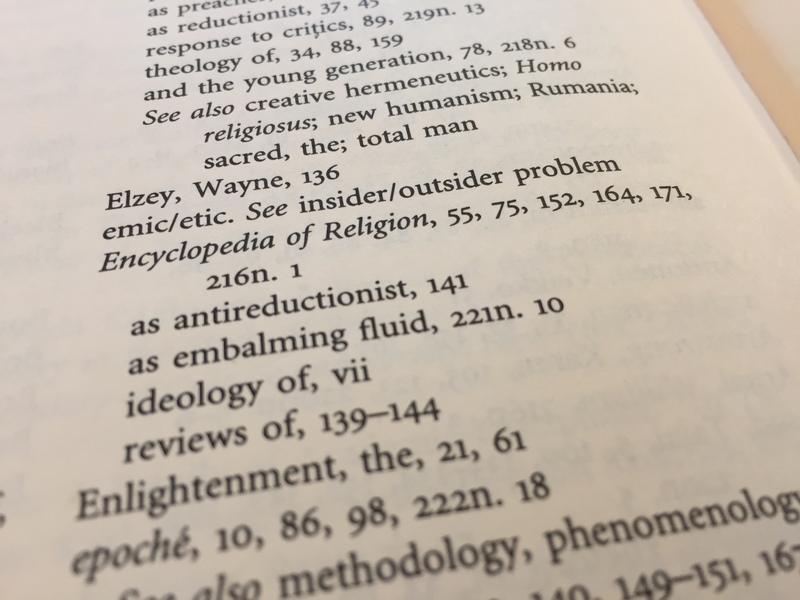 This entry was posted in Faculty Blog, Public Events, Relevance of Humanities and tagged Index, Indexing by Russell McCutcheon. Bookmark the permalink.